Using the latest web-technologies, it is with an entire HTML5 website for content display and animation that the architecture firm A3 Associates is now presenting itself on the web. This website is perfectly compatible with Iphone and Ipad mobile devices. This web-platform is even more dynamic given the absolute control made available using GlobalVision’s content management system (CMS). 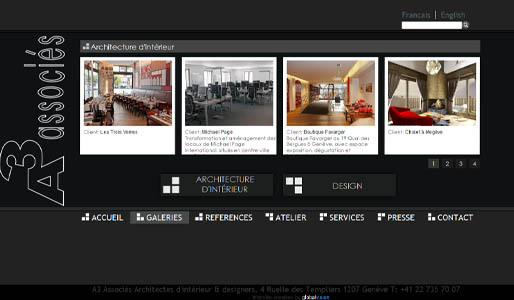 A3 Associates can control galeries, references, news, and press articles in a very simple and useful fashion, allowing for 100% control of the platform. GlobalVision webdesign and programming, made an entirely dynamic website, fully adapted to the requirements of modern- and future-web standards. By integrating all elements one could expect to find, such as before- during- after- projects galleries, references portfolio and company profile in a dynamic and efficient manner, the firm now has a complete online presence to match its visitors interests. Additionnally, given the firm’s interest in 360° immersive pictures, a specific tab was integrated and allows to see selected projects in 360° vision, as if you were standing in the middle of the room.